protect the New River water quality and the native pristine air! WHY DOES GLENDALE SPRINGS NEED HELP? An application for a permit for the construction of an asphalt plant in this community (at the quarry on Glendale School Road) that would produce 300,000 tons of asphalt a year was submitted on June 5, 2015. In producing this tonnage, 178,717 pounds of hazardous chemicals would be emitted into the atmosphere each year. To see a video to learn more about this proposed plant, click here ( * ). The location of the proposed asphalt plant is not suitable for this polluting industry! Below is a list of the hazardous chemicals that would be emitted from this asphalt plant (run by a firm named Appalachian Materials). This list came from the above mentioned permit application. To learn more about the many harmful and deadly effects of asphalt plant pollutants, click here ( * ). You have probably heard that an Ashe County Board recently ruled in favor of the asphalt plant, and the the Ashe County Commissioners then voted unanimously to appeal that ruling in Superior Court. If you would like to know exactly what is being appealed, and why, then continue reading this website! Why should the recent rulings of the Ashe County Watershed Review be appealed? Probably the most important reason deals with the protection of the water supply in watersheds all over this state. FYI: “watershed” refers to a specific part of a river which has water in it that will be diverted so that after being treated, it will be sent to people's homes. The proposed asphalt plant is on a parcel of land that has a creek running through it that empties into the South Fork of the New River at a location that is within the watershed for the town of Jefferson. In1993, the N.C. Legislature created a Watershed Protections program. Among other things, this stated that local governments were supposed to establish their own set of ordinances regarding the protection of their watershed(s)...and if there is a conflict between what protections they established and what the State mandated: the local government's watershed ordinances would be the ones that needed to be adhered to if they were more rigorous/demanding. In the recent rulings by the Watershed Review Board, this Board instructed Adam Stumb (Ashe County's Planning Director, who is also Ashe County's Watershed Administrator) to ignore a lot of Ashe County's watershed protection ordinances, and to issue a watershed permit to the firm wanting to operate an asphalt plant: Appalachian Materials, LLC. The Watershed Protection Ordinances of Ashe County are essentially identical to the watershed protection ordinances found in ALL of the other rural N.C. counties. If this Board's ruling is not over-turned on appeal, then a lot of the watershed protection ordinances across the state will have essentially been wiped off the books...since this case will have set a legal precedent for all of those counties. That means the drinking water for folks living all across this state could be put at great risk! (2) Protect water quality by preserving/restoring natural buffers adjacent to streams. At the heart of the program is a philosophy that allowing Mother Nature to naturally protect water quality is superior to engineered solutions. The D.J. Cecile family, through three separate corporate entities, controls a 30-acre lot in Glendale Springs off Glendale School Road. Radford Properties owns this lot, and Radford Quarries of Boone uses the lot for quarry purposes. Appalachian Materials has leased 3.58 acres for a proposed asphalt plant. Starting in 2015, the Ashe County Watershed Administrator (Adam Stumb) has been requesting Appalachian Materials to provide a site plan for the asphalt plant development. Because of new information he had learned, in January of 2017 he asked for significantly more information. Appalachian Materials failed to provide the additional information he requested. In July of 2017, because he and the county staff still had not received any of this new information he requested, he denied the watershed permit. That is when Appalachian Materials appealed his ruling to the Ashe County Watershed Review Board. Is Appalachian Materials required to comply with the subdivison regulations in the Watershed Protection Ordinance? A book explaining the legal definition and ramifications of a subdivision in N.C. (“Land Subdivision Regulation in N.C.” written by Adam Lovelady) states that when as few as one leased tract of land is created within a larger parcel, and the activity on this leased area is not the same as the activity in the rest of the parcel, then a subdivision has been created. The example used in this book to describe when a subdivision has been created refers to a mobile home park...where lots are leased to different entities. Even though the Cecile family through 3 different corporations controls a 30-acre parcel, one of those corporations (Appalachian Materials) was created to lease 3.58 of those acres for the purpose of placing an operating asphalt plant on it. This lease was created for liability limitation reasons. Legally, each of these 3 corporations is a different entity, no matter who controls them. The other two corporations are there for the purpose of operating a quarry. Obviously operating a quarry is not the same as operating an asphalt plant. Thus, via N.C. law, a subdivision was created when Appalachian Materials leased land to operate an asphalt plant. To read a legal brief detailing subdivisions in a watershed: click here ( * ). The Watershed Review Board ruled that a subdivison had not been created when Appalachian Materials leased land for a proposed asphalt plant. Can Appalachian Materials use the entire 30 acres of the Lot to calculate the Built-Upon-Activity of the project? Since a subdivision has been created by the lease of land by Appalachian Materials to operate an asphalt plant: the Ashe County Watershed Protection Ordinance essentially states that development on a tract of land within a subdivision cannot exceed 24% of the total acreage of that tract. The amount of land leased by Appalachian Materials is only 3.58 acres, and there was no dispute that the development of an asphalt plant would occupy more than 24% of that land. The Watershed Review Board ruled that the entire 30 acres could be used to make this calculation. Does the Watershed Administrator, possessing the full police power of the County under the Watershed Protection Ordinance, have the power to request applicants for permits to provide a site plan showing the proposed new development? When someone in Ashe County wants to build a house, it has to submit a site plan which shows such things as where the house will be located, where the drinking water will be coming from, where the sewage will be going, what products will be used to build the house, where and how the electrical power will be supplied to the house, etc., etc. The reason for this site plan: to make sure the County's existing building codes are adhered to. Common sense would suggest that it makes sense that a site plan should be submitted for a polluting industry like an asphalt plant. Common sense also leads one to believe that if the State gives a local government the right to create and select a Watershed Administrator, it would also give that person the ability to do those things necessary to protect the watershed. In fact, past legal rulings do in fact give this person the flexibility to do those things that lead to a protected watershed. The Watershed Review Board ruled that the Administrator does not have the power to request a site plan. Is the stream buffer on the lot in compliance with the Watershed Protection Ordinance? As stated earlier, one of the guiding principles the State of N.C. utilizes in protecting the waters within a watershed is to preserve/restore natural buffers adjacent to streams. Ashe County's Watershed Protection Ordinance states that in areas where the development exceeds 24% of the acreage in a tract of land, there should be a 30-foot buffer on both sides of a creek. The ordinance also states that NO new development is allowed in those buffered areas. As opposed to adhering to this dictate, documents submitted by Appalachian Materials show a road crossing the creek that runs through this tract of land. This road could be used by trucks hauling asphalt. The Watershed Review Board ruled the stream buffer was in compliance. Did the spill containment plan proposed by Appalachian Materials satisfy the Water Protection Ordinance requirements? The idea is that when toxic and/or hazardous material is stored at a development, a heightened engineered solution – a spill containment plan – is required. In considering the adequacy of the spill containment plan for this development, the County believes that site specific conditions are relevant. This proposed asphalt plant is located on the side of a mountain in close proximity of a perennial stream flowing down the mountain to the South Fork of the New River with truck transportation facilities (roads, etc.) running adjacent or across the stream. The only plan submitted was a concrete storage basin located under elevated tanks storing 60,000 gallons of toxic/hazardous material. The Watershed Review Board ruled that the spill containment plan offered by Appalachian Material did meet the Watershed Protection Ordinance requirements. The last two rulings to be examined are somewhat similar. Does the Watershed Administrator, possessing the full police power of the County under the Watershed Protection Ordinance, have the power to request applicants for permits to provide a site plan showing the new development? And... Does the Watershed Administrator, possessing the full police power of the County under the Watershed Protection Ordinance, have the power to request applicants for permits to provide sworn affidavits and information about past violations of the Watershed Protection Ordinance on the Lot? When the Ashe County Commissioners in 1993 created the county's Watershed Protection Ordinances, they adopted a lot of the State's mandates, and they made some other mandates more rigorous. In adopting most of the mandates, some of those dealt with enforcing these Watershed Protection Ordinances. The N.C. General Assembly has mandated that the County, by law may “define, regulate, prohibit or abate acts, omissions, or conditions detrimental to the health, safety, or welfare of its citizens and the peace and dignity of the County; and may define and abate nuisances.” To be sure that the courts and boards construe county police power broadly, the N.C. General Assembly also gave explicit instructions to interpret this police power broadly. The Watershed Review Board ruled that the Watershed Administrator did not have the power to request a site plan or get information about past violations of the Watershed Protection Ordinance. A question that comes up: why did the members of the Watershed Review Board vote as they did? To answer that, you will have to ask them. Why did the County Commissioners unanimously vote to appeal these rulings? *** If you google "Ashe County delinquent taxes" you will get to an Ashe County government website that has a link for "Delinquent Taxpayers List as of 4-15-2018." After clicking onto that link, you will be taken to a website that is a pdf file showing all of the entities with delinquent taxes. If you scroll down to "Radford Properties Inc" and "Radford Quarries of Boone Inc" you will find seven entries totaling $17,152.29 (as of August 14, 2018). *** The creek running through the quarry goes under Glendale School Road and then enters property owned by Robert and Nancy Sumner, before emptying into the South Fork of the New River. In July and September of 2012, two employees NC. Department of Environment and Natural Resources (Tim Latham and Matthew Gantt) inspected the quarry. The quarry was found to be out of compliance in both inspections. The reports they wrote up can be seen by clicking here ( * ) and here ( * ). These inspectors are based in the Winston-Salem Regional Office. Mrs. Sumner went to that office in August of 2015. She found that there had been no other inspections of that quarry after September of 2012. She later sent an email asking why. On August 28, 2015 Tim Latham sent her a reply, which can be seen by clicking here ( * ). You can see that on the second page of this email, he told Nancy that "the last inspection was conducted 9-25-2012, by Matt Gantt PE, Winston Salem Regional Office Land Quality Regional Engineer, and myself. The site was noncompliant during our inspection. After the inspection, Matt and I decided that we should request additional support from the Raleigh Central Office during our inspections for safety. During the inspection Mr. Cecile displayed a firearm to us. The site has not been inspected since that day." The quarry was not inspected again until December 3, 2015. Hence, Mr. Cecile's showing of a gun scared the inspectors away for over 38 months! And FYI: all emails to and from Mr. Latham (a State employee) are considered public knowledge. ***All quarries and mines in the U.S. are inspected by the Mine and Safety Health Administration (MSHA) of the U.S. Department of Labor. If you go to the MSHA website ( www.MSHA.gov ), and then click onto the "Get violation, accident and inspection data for any mine or contractor" link, you will be directed to a webpage that has blocks where you enter a "MSHA Mine ID #" as well as a beginning and an ending date. The mine ID # is: 3102067. The beginning date should be May 25, 2008 (since that is the date D.J. Cecile started operating this quarry). The ending date should be the current date. Below that you will find a link for "violations" which you should click onto. Then scrolling down, you will find a red icon on the far right stating "get report" which you should click onto. You will end up with a report showing that Radford Quarries of Boone, Inc. has 35 fines (as of July 20, 2018) totaling $12,054.00 that are labeled as delinquent. ***In the full-page picture below, you will see a delta in the river caused by years of sediment run-off from the quarry. Other pictures will show the sediment from the quarry on Glendale School Road (that borders the quarry). ***Appalachian Materials, LLC is a limited liability company formed under the laws of Tennessee on July 13, 2011. The State of Tennessee administratively dissolved Appalachian Materials, LLC on August 6, 2017. It must be pointed out that if the asphalt plant is allowed to start operations, then because of its size: it will be self-monitoring concerning air and water quality regulations/specifications. Neither the federal EPA nor the NC Department of Environmental Quality will do testing/monitoring in these very important environmental areas. To see how perilously close the proposed asphalt plant could be to the very young children with terminal diseases at Camp New Hope, click here: ( * ). Adam Stumb, Ashe County's Planning Director (and Watershed Administrator), on July 7th informed Appalachian Materials, LLC that the Ashe County Planning Board was immediately ceasing their processing of the watershed permit that had been applied for in June of 2015. This was done because Appalachian Materials, LLC had not supplied the Planning Board with any useful data concerning the numerous requests for information this Planning Board has made to Appalachian Materials, LLC concerning what had taken place during the last couple of years on the parcel of land where the quarry is located (which is where the proposed asphalt plant will be located). To read Mr. Stumb's decision, click here ( * ). 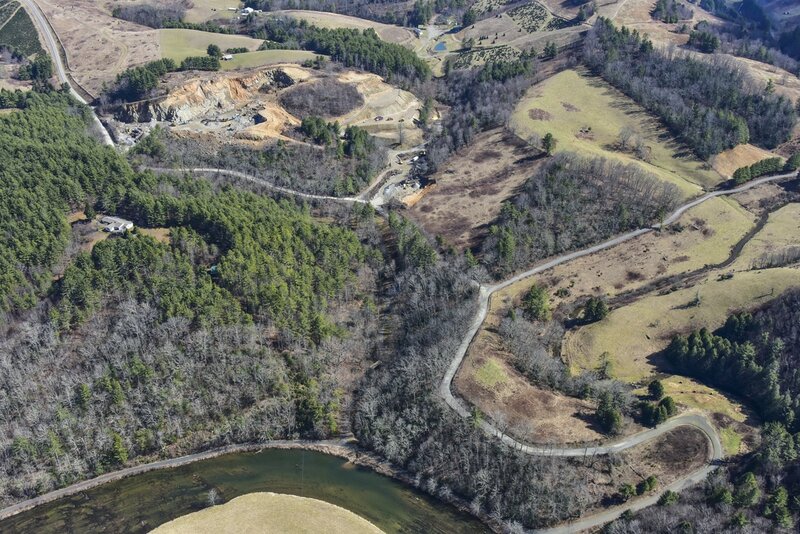 To briefly show what Mr. Stumb's decision is based on: below on the left is a picture of where the asphalt plant will be located that was submitted on June 5, 2015 by Appalachian Materials, LLC in its application for a permit to operate this asphalt plant. On the right is a picture taken on Labor Day, September 7, 2015 of the same location. If you look at the yellow star on the picture on the left, and then look at the same area on the picture on the right, you will notice that this area (in the picture on the left) shows a hill covered by trees. And this same area (in the picture on the right) shows a hillside that has been terraced. location that is part of the watershed for the town of Jefferson, NC (which means water from this part of the river is water that folks in Jefferson, NC will be drinking), Ashe County's Watershed Protection Ordinance (that was adopted into law in 1993) requires that a permit is needed to do any grading that may pose a threat to this watershed. No permit was (or has ever been) applied for concerning this terracing that is shown on the picture on the right. Because since January 24, 2017 Appalachian Materials, LLC had not responded to any requests for information from the Planning Board concerning what had taken place at this location, Mr. Stumb stopped processing the application for a needed watershed permit. wrote an in-depth front-page article about the proposed asphalt plant. To view that article, click here ( * ). there should not be an asphalt plant in Glendale Springs. To view that editorial, click here ( * ). WHAT AND WHO WILL BE HARMED (besides the campers at Camp New Hope)? This proposed asphalt plant is less than a mile from where President Clinton proclaimed that the New River was an "American Heritage River" ...and thus is and should remain pristine and free of hazardous pollutants. In the above photograph on the right (taken on January 13, 2017), you will notice that there is so much sludge on the road (which is at the lower entrance to the quarry), that you can barely see the double lines in the middle of the road. You will also see a large puddle of muddy water. Just on the other side of the metal road barrier (about 4 feet below the paved road) is a small creek (pictured on the left) that meanders for a couple of hundred yards before emptying into the pristine south fork of the New River. The photograph above (taken on February 24, 2017) clearly shows that when rain occurs, the "sludge" on Glendale School Road can quickly end up in the south fork of the New River via the creek located just on the other side of Glendale School Road. This causes a REAL threat to all living things near and down-river from this in the river. This picture shows the exact place where the creek enters the river. It is easy to see the ever-growing delta formed in the river from the dirt and gravel that has been swept into the river via the creek. HOWEVER, imagine if the asphalt plant was in operation, and asphalt residue was added to this sludge by falling off of dump trucks leaving the quarry area. This oil rich mixture would cause a threat to ALL species in the river, and those species that would be drinking water with this in it (which would include those folks living in Jefferson). And FYI: asphalt is merely a mixture of heated petroleum products and gravel. One other concern: what happens if there is a fire at the asphalt plant...such as the one that can be seen via YouTube by clicking here ( * )? Firemen will use foam (and water) to put out the fire. Where will all of this liquid end up going? Since there is nothing to stop it, gravity will send it to the above mentioned creek…which will then send it to the river! The photograph on the right was also taken on February 24, 2017. The reason for posting this picture: to show the relationship distance-wise of the quarry (at the top left of the picture) to the creek entrance into the river (which is the small brown area in the river at the bend of the river). Since the sediment pictured has been formed in the last several years, the scary question is: what will the river and this "ever growing delta" look like in the future (such as 20 years from now)? Pictured below is the place where the creek that catches all of the rain and sludge run-off from the rock quarry enters into the pristine south fork of the New River. This river then travels past 2 private residences and then past Camp New Hope . If an asphalt plant starts operation, then all of the asphalt that will be falling off of trucks leaving from it will quickly go into the river....thus affecting this exact location! Should this plant go into operation, values of land in this and surrounding communities are sure to fall! For proof of this: as of January 1, 2017, at least one local realtor had already lost two sales in Glendale Springs due to the proposed asphalt plant. Because realtors are supposed to advise potential buyers of any impending events that may affect the future worth of their real estate investment, a lot of folks are no longer looking at Glendale Springs as a place to purchase land and/or a dwelling. When the weather is warm, this mess stays on the road and dries out. The dust created when a car drives over it almost creates a white-out situation (which was the case last fall, for weeks, during the months-long drought) . This is VERY unsafe for another car going in either direction on this road. If the asphalt plant goes into production, the increased truck traffic will make this situation even more unmanageable. The proposed asphalt plant site is about one mile from the world famous frescoes by Ben Long at the Holy Trinity Episcopal Church (nicknamed The Church of the Frescoes). The church commissioned a seismic study to determine if the trucks from the existing quarry were causing damage to the frescoes. The study showed that this is exactly what was happening. The large loaded trucks rumbling past the church cause the foundation to “tremble” and this disturbance is detrimental to the integrity of the frescoes. If the asphalt plant is put into operation, there will be an estimated 17,647 loaded trucks passing by the church each year. Also, if one studies Europe's frescoes, you will find that vehicular emissions also do great damage to these works of art. Logistically in Glendale Springs, there will also be 17,647 empty but still heavy and exhaust-spewing diesel powered dump-trucks passing the church. And this does not include the thousands of full (and empty) tankers transporting petroleum to the quarry (since by definition, asphalt is hot petroleum mixed with gravel). This is a devastating prospect for an Ashe County treasure and major tourist attraction! 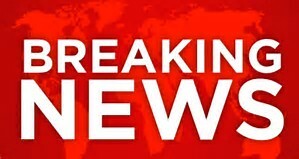 * So that the Protect Our Fresh Air (POFA) chapter of the Blue Ridge Environmental Defense League (BREDL) can hire lawyers to submit Friend of the Court briefs in the appeal being heard in Superior Court. These briefs would show why this is a statewide issue as opposed to only being an Ashe County issue. Legal counsel is needed so that these briefs can be professionally and correctly done. To learn more about the Blue Ridge Environmental Defense League, and/or obtaining a $20 1-year membership subscription: click here ( * ). 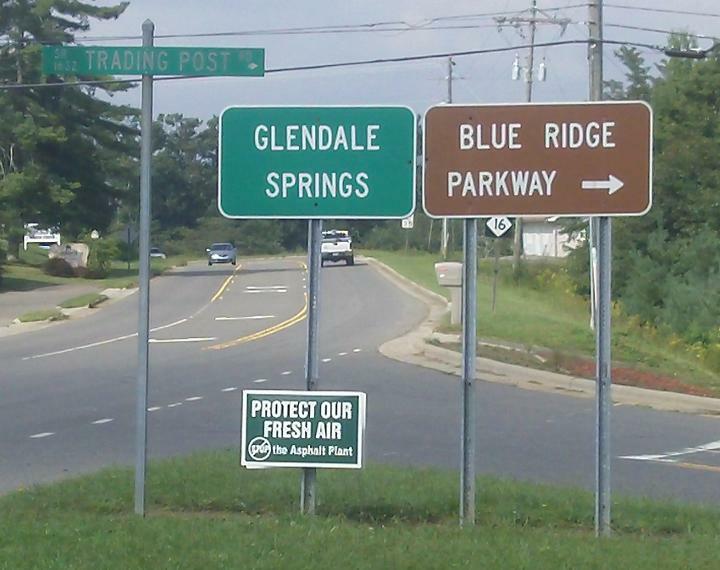 If YOU think it is unwise for an asphalt plant to be built in what up to now has been pristine Glendale Springs, hopefully YOU to will make a donation to this worthy cause! to come to this website for updates on this matter.